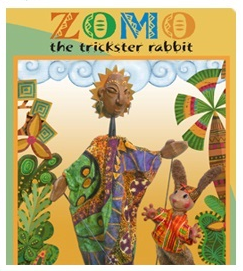 Zomo the Trickster Rabbit Puppet Show - Luce Puppet Co.
Download the Zomo the Trickster Rabbit Poster! Download the Zomo the Trickster Rabbit Coloring Page! Clever Zomo the Rabbit thinks he’s the fastest, smartest rabbit in all of Africa, but wants more… Perhaps wisdom! Nyame the Sky God tells Zomo what he needs to do. Lively adventures follow with Cow, Crocodile, and Leopard, in this engaging tale.